Sago Palm belongs to one of the oldest-known plant families and is one of the most majestic. 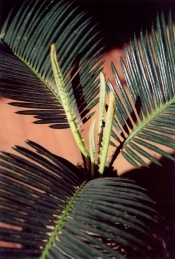 Despite its common name, it's not really a palm but a Cycad, one of the most primitive of plant families that covered the earth during the age of dinosaurs 200 million years ago. This tropical plant is extremely slow-growing, but over many years develops a substantial trunk. Topping the trunk is a rosette of shiny, stiff, narrow fronds arching slightly at their tips. Although the rigid leaves appear tough, they are easily damaged and should be handled carefully. Sago Palm care is easy if you keep a few things in mind. It doesn't like its feet wet, so keep the soil on the dry side. Give it light every day and fertilize lightly during the growing season. This plant doesn't really like to be disturbed, so repot only when necessary. Pruning can be done anytime to remove dead fronds. 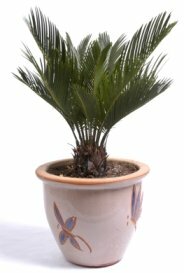 Sago Palm problems are usually related to watering. Yellowing leaves are often caused by overwatering. Follow the watering instructions below to avoid crown rot. It's almost impossible to treat and plants may not recover. Scale insects are the most common pest. Look over your plant often for scale and treat any infestation immediately with insecticide. CAUTION: All parts of this plant are poisonous, especially the seeds. Keep it out of the reach of children and pets that may play with or ingest this plant. Cycas revoluta is a long-lived plant. Fifty-plus year-old plants are not uncommon. It is becoming more popular and easier to find in garden centers and online nurseries. Height: Up to 6 ft (1.8 m) indoors. Can be kept dwarfed by growing it in a small pot. Sago Palm is also popularly grown as a bonsai tree. Light: Bright light with some direct sun. Turn the pot a quarter turn at least once a week during the growing season. Otherwise, the plant will lean toward the light source. Water: Take care to water the soil, not the crown of the plant which can lead to crown rot and may kill the plant. Water thoroughly and allow the soil to dry out a bit between waterings, but don't allow it to dry out completely. Water less in winter. Provide good drainage. Humidity: This beautiful plant prefers relative humidity above 50%. You can set it on a tray of wet pebbles to raise the humidity around it. Use a room humidifier for best results. Soil: Cactus potting mix works well for fast drainage. Or combine 2 parts peat-moss based potting mix and 1 part horticultural sand or perlite. Fertilizer: Feed monthly spring through fall with a liquid fertilizer (such as 18-6-18) diluted by half. Only fertilize when watering to avoid fertilizer burn. A slow-release fertilizer also works well, but I only use half the amount recommended on the package. The leaves will shrivel and dry up when it has been over-fed. Propagation: Seeds take months to germinate and years to grow into a tree. Everything about this plant is s-l-o-w. Mature plants grow offsets -- called pups -- that can be separated and planted into their own containers.